So-called “fact-checking” websites have objected to Breitbart News’ use of the term “forgery” to describe the yearbook that Roy Moore accuser Beverly Young Nelson and her lawyer, Gloria Allred, have used in attempting to corroborate Nelson’s allegation that Moore sexually assaulted her some 40 years ago. Politifact labeled the claim “Pants on Fire,” and Facebook has even attached a pop-up warning to a Breitbart article about the alleged forgery. On Friday, Nelson admitted that she had added “notes” to an inscription that she claimed Moore made in her high school yearbook. She still claims that Moore signed the yearbook, but admitted that some of the writing was hers. Originally, both Nelson and Moore claimed that the entire writing was Moore’s. At the press conference on Nov.13 where Nelson presented her story, both she and Allred read the inscription in the yearbook in full and stated clearly that Roy Moore was responsible for all of it. Politifact suggests that Breitbart News claimed Roy Moore’s signature is false. We did not — though there are some online sleuths who do, or who claim that the “Roy” is real but the “Moore” was added later, in different ink. That is all irrelevant, however. 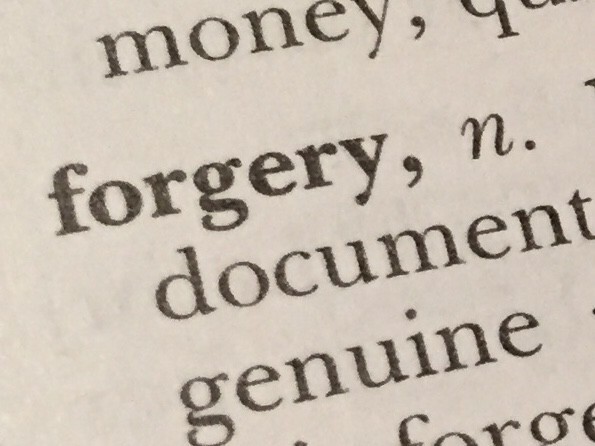 If even part of the document was altered, it is a forgery. The yearbook was presented not just to show that Roy Moore knew Nelson, but to establish the time and place where he allegedly assaulted her. We now know that at least some of that information was not written by Moore, as Nelson and Allred originally claimed. Not only did Nelson and Allred claim, falsely, that Moore wrote the entire inscription, but they refused to offer it to a neutral and independent expert for analysis. And they waited more than three weeks to admit that the inscription had been altered. That is forgery, and to the extent it casts doubt on Nelson’s story, that is her, and Allred’s, fault.